This RGB+W LED colour controller has a touch sensitive colour wheel for easy light colour selection. 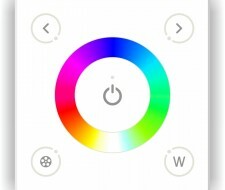 This colour controller has dimming and fading options. A static white can also be selected on the colour wheel. 12-24V RGBW LED strip and a low voltage transformer wire directly into the back of this controller. Same size as a standard UK wall switch. Compatible with standard 35mm deep plastic back boxes, back box is not included.